Sectarianism creates a lack of strength for common projects. Sectarianism also decreases defense against dangers for Vaishnavas and their service. The high morality of true followers of sanatan dharma should shine brightly as they recognize each other and cooperate on common issues. The vision of Sri Chaitanya Mahaprabhu was to help the entire world. From Him a wonderful tree with many branches and spiritual masters has manifested. 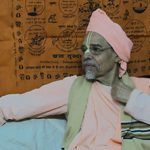 Specially after the great personalities of Srila Bhaktivinode Thakur and Srila Bhaktisiddhanta Sarasvati Prabhupada, many new branches embraced the world and many Vaishnava spiritual masters are informing the world about the all-embracing love taught in the Bhagavat Gita. 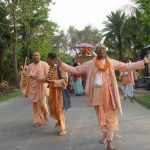 To serve this purpose the Vishva Vaishnava Raj Sabha, which was originally started by Srila Jiva Gosami, was headed by Bhaktisiddhanta Sarasvati Prabhupada. 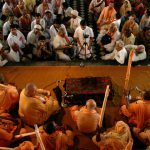 To create s system of many secretaries of all missions who have this broad vision was the contribution of Srila Bhakti Ballabh Tirtha Maharaj. 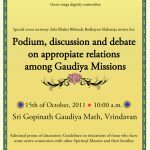 With the help of many Vaishnava acaryas, meetings are held regulary in different maths. Also the modern technology of E-mail and web sites are used to serve the Vaishnava world. Many committees try to provide help for the individual missions. 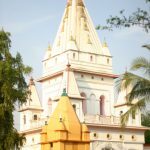 With the help of Srila Bhakti Promode Puri Maharaja's mission's new acarya Srila B.B. 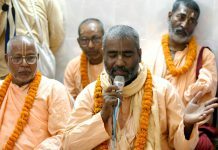 Bodhayan Maharaj, a permanent office with Internet assistence for Vaishnava sannyasis and mission secretaries was established in 2008. Vina.cc the news page of the WVA is now being published in Bengali, English, Russian and Spanish. But we need the help of all. Due to individual failure, relationships between different missions sometimes get disturbed. Also communication is almost absent even though they serve the same purpose in many wonderful ways. For a better future it is important to preserve the WVA platform. There are no missionary ambitions or Guru-sisya relationships in the model of the WVA. 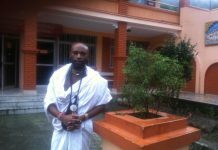 It is a platform to relate amongst mature, respectful and nonsectarian Vaishnavas. Only through such communication can we progress towards our common causes. Please help us and participate by coming yourself or by appointing secretaries for your mission to sit and participate in the WVA meetings. The WVA is not just for issues of Vrindavan and Navadvipa. 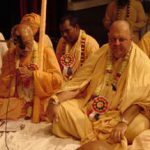 No, it is for helping the Vaishnava's service all around the world. Therefore Srila B.B. Tirtha Maharaj requested secretaries from each mission for every city or country where they have branches. 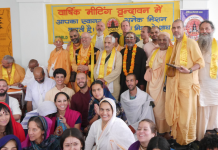 In this way the help of the WVA easily reaches to all places where Vaishnava missions meet each other in their missionary activities. A bright future is assured if we simply follow the humble mood of our acaryas and keep our communication alive.